On Tuesday 10 November 2015 I went out with Ian Sherriff from Plymouth University, Ann Pascoe from Dementia Friendly Communities in Scotland (@a_carers_voice) and Rachel Silcock from Plymouth City Council. We were all supporting the amazing volunteers from Dartmoor Search and Rescue (DS&R) in a training exercise. 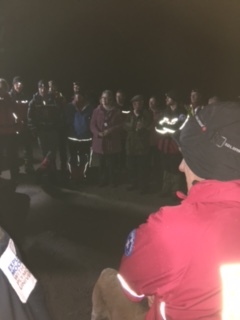 We met on Roborough Down at about 7pm, the evening started off halteringly, as there was someone lost in the Tavistock area and the Plymouth team did not know whether they would have to go out on a real search to assist the Tavistock Team. 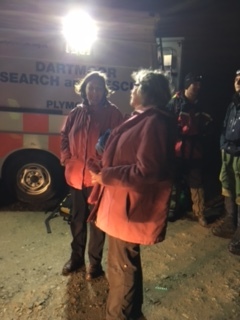 Anyway the person in Tavistock was found and we were able to continue with our exercise. It was dark and there was intermittent drizzle, but not too cold or too wet. We gathered around the Search and Rescue van for the briefing. Standing around in the car park made me glad I was wearing something windproof & warm. Then Ian went off with Ann, supervised by someone from DS&R, to make sure that at all times they were both safe. 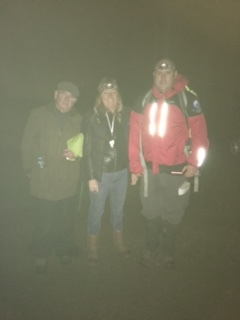 I was allowed to join in with one of the search teams as we went to look for them using the GPS tracker Ian was wearing. The co-ordinates were given in longitude and latitude and DS&R use OS coordinates, so they had to convert it. After about 20 minutes of walking over rough ground on Dartmoor Ian was found & briefed to behave like someone with a dementia. He was dazed & confused, we as the observing teams watched from a distance and the team dealt with him and tried to get him to come back to the van. He became nervous and made a dash in the other direction and the rescue team followed and brought him safely back to the van. Then we de-briefed. There was a discussion that the observers were too close, but had been asked to step forward in order to effectively observe. In a real life situation it would have been done differently, but we all knew it was a training exercise. Then I was asked to be “found” and briefed to be a tearful and then aggressive woman. So off I went, accompanied by Ian and a very lovely man from DS&R, who made sure that I was safe. We found a spot to wait & he radioed back to get the team to find me. It took about 30 minutes from the time we left the base for them to find me. I was approached by a very warm and kind man who asked what I was doing and I said that I was looking for my cat. He asked what my cat looked like & told me they had a cat that looked just like mine back at the van, so it might be tiddles!! When he came near me, I then became very agitated and shouted at him not to touch me and moved away, pretending to be both scared and aggressive. The response was fantastic, he asked the whole team to move right back, even though they had never been that close. In moving away from my rescuer, I got within about 2m of a leat and they were immediately worried for my safety and moved me to a safer spot. I was then slowly walked back to base and a very warm and friendly lady walked slightly closer to me and chatted to me about her cat and my cat. The team were warm and friendly and when I told them my name was Dorothy (even though they had been looking for Hilary), they just went along with my fiction. We chatted about all my 9 cats and the dogs I had whose names I couldn’t remember, I told them I was 27 (I wish) and about the farm I lived on. And even though I shouted at them, they stayed calm and kept me safe. The debrief was again interesting and they felt that finding someone with a GPS tracker would make life much easier, as it was accurate to around 0.25km, which gives a pretty small space for them to look in. My feedback was about the care that the group had taken and their kindly approach, which de-escalated this situation very effectively. I was told that they go out on exercise every week, come rain or shine. They do about 30 searches a year, looking for approx 30-40% suicides or despondents and sometimes they get there too late. Another 30-40% of people have a dementia or some other form of confusion, very few of their searches are for lost hill walkers. They are all volunteers, who give up their time for the safety of us all. I want to express my thanks and profound admiration for the work that they do. Thank you for a great fun and interesting evening.